The Cotton Carrier Camera System consists of a Vest Unit and removable Side Holster that allows you to keep a second camera on your Vest Unit, or remove and place independently on your pant belt or the waist strap of your favorite camera bag. You also receive two 10-degree Camera Hubs (suitable for ALL camera types) that comprise an anodized aluminum hub, a stainless steel marine grade bolt, and a high-density rubber washer. You will also receive two Camera Tethers, two Hand Straps and one Universal Adapter Plate. NOTE: these updates are ONLY applicable to the Black version of our vest! 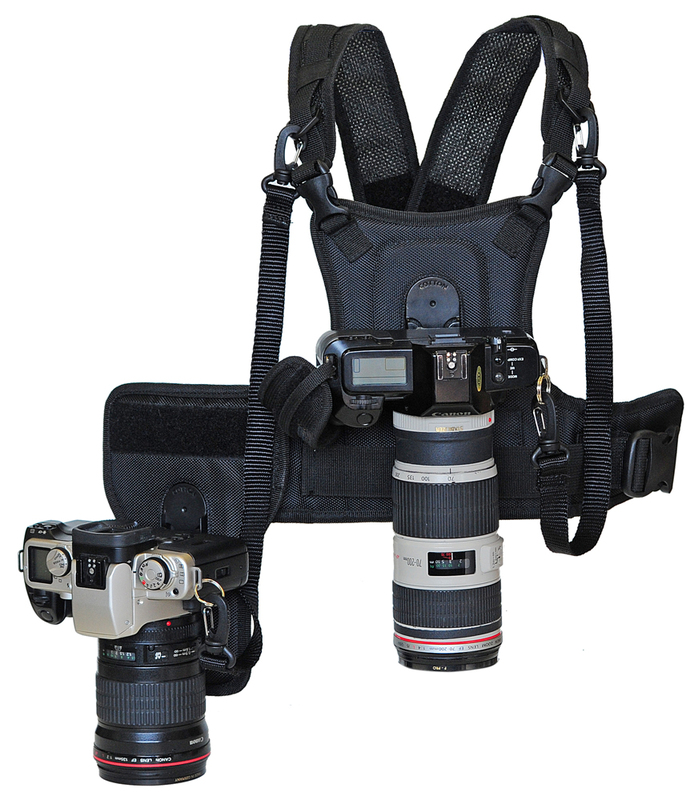 The complete dual camera vest system has you ready to be up and running with one or two cameras immediately, and put an end to irritating neck strain and fatigue created by traditional camera neck straps.